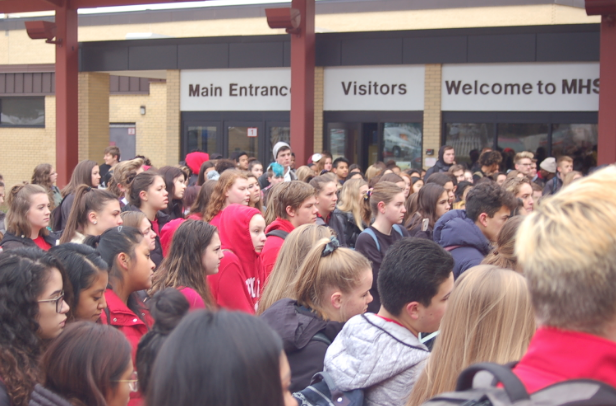 A crowd that grew to over 180 students gathers in front of the school’s main entrance on November 19 to listen to their peers speak out against sexual harassment and assault at MHS. “The girls at Middleton have reported people for harassment and assault, but not enough has been done,” Grace Madigan declared over a crowd of 180 students huddled together outside of Middleton High School’s front entrance in frigid 25-degree weather. The November 19 protest, organized by Porsha Hanifl, an MHS senior, and Ozzy Benitez, a junior and former MHS student, was a response to the stories of sexual harassment shared on social media by over one hundred MHS girls the weekend before. Several student speakers, along with Madigan and Hanifl, shared their own experiences with sexual harassment and their continued witnessing of it at Middleton High School. SHAPE club was started towards the end of the last school year by Brutosky and fellow junior Katie Joslyn as a way to improve the issues of sexual assault and harassment they saw in the school. Since its founding, the club has presented two “Embrace Your Voice” weeks. Each day students gathered in the PAC during advisory and watched presentations from experts in the field of sexual violence prevention and education. Informative skits were also written and performed by student members of the club. 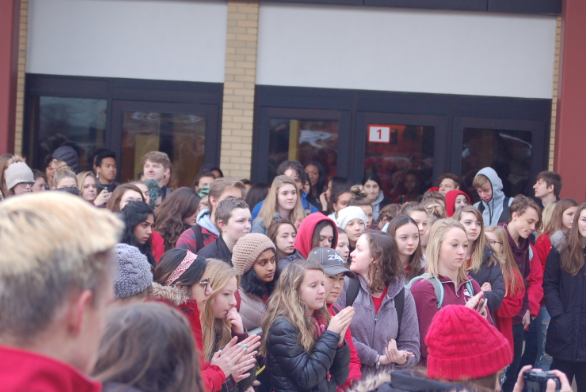 Many students wear red to the protest as a sign of solidarity with sexual assault survivors.